On walks around our Willow Glen neighborhood here in San Jose, California, I occasionally see paw prints in the sidewalk concrete, permanently recording the adventures of some curious animal. Recently, there was a news story about Cat Paw Prints Found on 15th-Century Manuscript. There is even a funny blog entry on how to achieve this cheaply. These prints are the more charming for being rare. 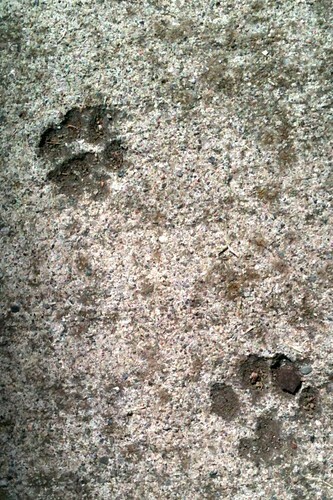 The cat prints pictured above are two of four in an old sidewalk near our house. I was surprised recently when visiting a Silicon Valley company headquarters to see many lines of crisp prints in a new sidewalk, with each pair too far away for a normal cat stride. 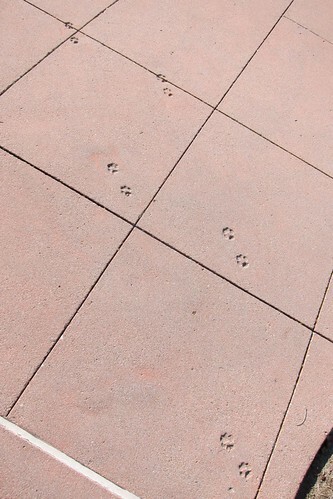 I conclude that some hardscape designer is selling a paw print stamp option for walkways. Institutionalized whimsy. one wonders how a real cat could pace such a sequence ??? Yes, I’m more fond of my real-life-cat-prints in our kitchen 😉 Glad you liked my funny post, thank you for linking up!